This freestyle frame gives you ultimate control over weight distribution and CoG by not only allowing the use of any size standoff (down to a Hyperlow 10mm) but also offering a reversible build orientation for a true mid-mount set up. The removable camera bumper can be attached to the 2mm 'top plate' for an undercarriage conversion after flipping the frame. ESC's then secured to the underside of the arms render them immune to prop strikes. A simple but effective 1.5mm battery mounting plate allows for double strap maximum battery security keeping your lipos perfectly safe. 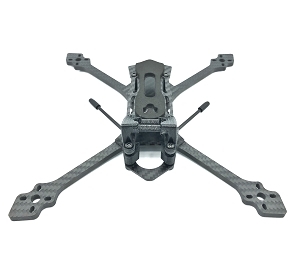 With the battery weight lowered into the prop plane, the mid-mount setup gives you the locked in feel of a top mount combined with much smoother handling and effortless transitions. Your P's will never be the same. 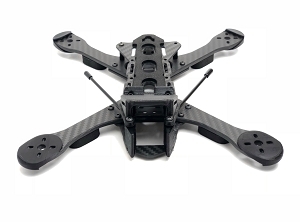 For pilots who may prefer a traditional top mount build for stylistic or practical reasons, the slotted top plate also provides for dual battery strap use while allowing you raise or lower the plate, and battery, to any height you choose. 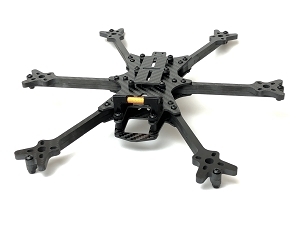 Fit your AIO flight controller, double stack PDB and FC, or even a power cube easily at 10mm, 15mm, 20mm, or higher. 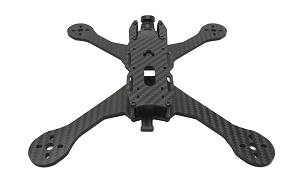 The main plate is 4mm twill carbon fiber, refined to offer minimal resistance and maximum durability after countless design iterations from hours in the air (and in the ground). Special attention has been made to widen the shoulders of the arms, while the mounting points offer protection for even the largest of new motors. 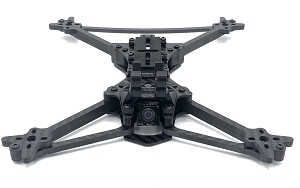 TPU camera mounts are included to house full size cams and add front bumper protection, while the additional GoPro Session mount offers complete security from above. The subtly stretched X motor layout provides additional protection from ground strikes at the front, while also offering increased sustained roll ability through turns. This thing carves! The frame has been designed for the HS1177 style camera case. Other than that, pretty much anything can be housed. The stack is attached to the main unibody plate for both builds. Be aware of your motor orientation for the midmount, as your left and right motor numbers will be reversed when flipping it over (i.e. when upside down the motor in Betaflight position 1 is actually motor 3, and motor in position 2 is motor 4). 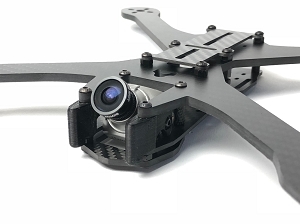 This could be ignored for wiring convenience, and the motor pads can be remapped in the CLI, which can also be used to switch between a mid-mount and top-mount build along with flipping board orientation (withing the GUI) and physically flipping motors and camera. Attention should also be payed to flight controller orientation so as to maintain easy access to the USB port. This may require it being flipped to be more central and not directly adjacent to either carbon plate.